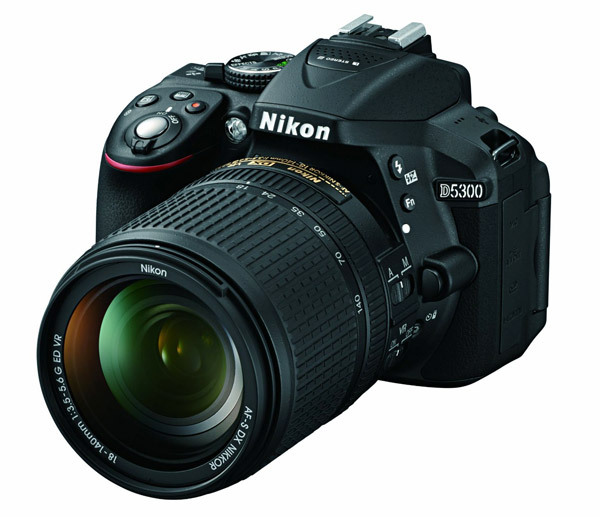 The mid range Nikon D5300 Digital SLR Camera is Nikon’s DSLR midrange DX format entry. The D5300 replaces the popular D5200 and is loaded with improved features. The D5300 has an upgraded imager with 24.2 megapixels. The camera has Full 1080p HD Cinematic Video with full-time autofocus and sound. Subject-tracking AF. Body mounted stereo microphones. The native ISO for low light photography is 100-12,800 (expandable to 25,600). Its side articulating 3.2 inch high resolution display (1,037,000 dots) allows you to get hard to get low angle and high angle shots. Built-in camera effects filters for both picture and video modes. Other features include LiveView so you can frame your movies and pictures, the new EXSPEED 4 processor, higher 60fps movie mode, 5.0 fps continuous shooting, Ultrasonic Dust Removal System removes dust from the sensor automatically, Active D-Lighting function which can vastly improve shadows and highlights of high-contrast scenes. 39 AF points (with 3D tracking). High Dynamic Range mode. Subject-tracking AF tracks and maintains focusing on a moving subject. Upgrades to the D5300 Model: The D5300 upgrades from the D5200, the processor upgrades from the EXPEED 3 to the EXPEED 4 processor (same as the top of the line Nikon DSLRs), new 24.2 megapixel sensor without an optical low-pass filter (OLPF) for better details. ISO expands from 6400 to 12800, a larger 3.2-inch screen (with higher resolution), a new high framerate 60fps movie mode has been added (with full time autofocus). Nikon has added Built-in Wifi to this model for 2014 to connect to tablets and smart phones. Built-in GPS added. Slightly smaller and lighter than the D5200. * Compatible with all NIKKOR AF-S and AF-I lenses that have an autofocus motor. DX has 1.5x crop factor. Shutter speeds: 30 – 1/4000 second, ISO: from 100-12800 (expandable to 25,600), Burst Mode: 5.0 fps, Built-in Flash. Memory Cards: SD, SDHC, and SDXC cards. Lithium-ion battery EN-EL14a (included). USB 2.0. HD Movie Modes: 1920 x 1080 (60p, 50p, 24p): at full 1080p; 1280 x 720 (60p, 50p): at 720p. MPEG-4 AVC/H.264, MOV codec. 38mbps bit rate. Dimensions: 4.9″ x 3.9″ x 3.0″ ( 1.17 lbs). 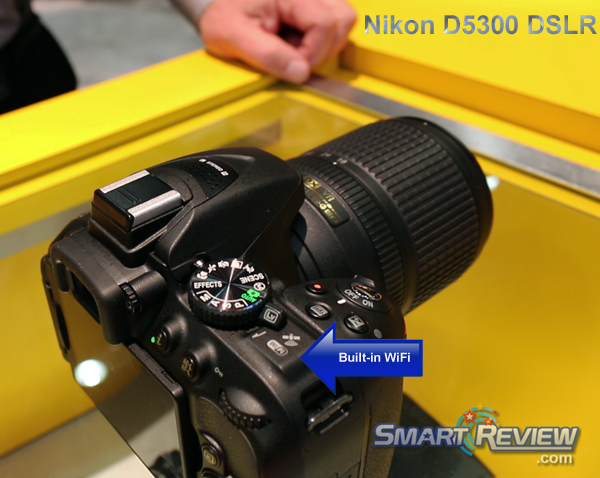 Smart-Review Commentary: Nikon’s 2014-2015 mid range D5300 DSLR is a big improvement from its predecessor, the D5200. It has a new imaging sensor with 24.2 megapixels. The Native ISO has increased to 12,800. This model has upgraded to the EXPEED 4 processor (same processor that is in the high end Nikon SLRs). Because of this upgrade, a new high framerate 60p and 50p movie mode has been added (and a higher recording bitrate). Shutter durability remains at 100,000 cycles. The Full Time AutoFocus feature will allow your DSLR to act more like a camcorder, so you don’t have to manually focus your video if you don’t want to. Also included are built in stereo microphones. The new built-in WiFi allows you to wirelessly connect to a tablet or smartphone. A microphone jack allows you to add external microphones like Nikon’s stereo ME-1. The Live View function uses the LCD to compose pictures and videos. We believe this to be an excellent mid range SLR in this price range. We previewed this DSLR at CES 2014. For its price and performance and new upgrades from the previous model, the Nikon D5300 is a Smart Review Top Pick.